It is nothing short of ironic that in an attempt to get healthier, one can actually get very sick. Working out at a gym is a great way to get in shape or maintain a healthy lifestyle. Unfortunately, it is also the perfect place to pick up unwanted germs. So just how bad are gyms? A study from the environmental testing group EMLab P&K found that an exercise bike can have 39 times more bacteria than a plastic, reusable lunch tray and 79 times more bacteria than a public water fountain. Free weights had 362 times more bacteria than a public toilet. Though it is true that not all germs are harmful, a third of them are. 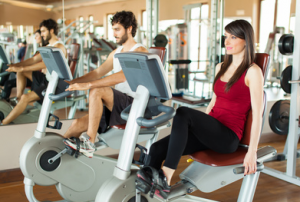 A recent study found that 10% of gym equipment has staph on it before it was cleaned at the end of the day. Common infections that can spread at the gym can range from the norovirus to athlete’s foot. While these facts may be a little scary, it’s not necessary to avoid the gym altogether. In fact, it is easy to stop the spread of these germs by remembering to wash your hands and shower after you work out. The best way to prevent the spread of these bacteria is to wipe down equipment before and after use. Sanitize and soap up, and your trip to the gym will be healthy and safe.